Our Camping Lantern features the LATEST LED TECHNOLOGY in the form of three 48mm COB strips. Gone are the 30 small LEDs of our previous lantern which gave out far less light per watt consumed. For this latest V2.0 version we've added a FLASHLIGHT in the base, giving unrivaled versatility coupled with our superior COB brightness. Ideal for INDOOR OR OUTDOOR USE, as perfect for camping and fishing as it is for keeping at home for use in power outages or relaxing in the garden at night. The COMPACT collapsed size means you can even keep one in the car for night time highway emergencies such as changing a tire or adding screenwash. BEAUTIFULLY PRESENTED in metallic graphite within an attractive HeroBeam box it also makes a great birthday, Christmas or Thanksgiving gift. SUPER BRIGHT - twice the brightness of old tech 30 LED lanterns thanks to a trio of the latest tech COB LEDs which brightly illuminate 360 degrees - enough to light a tent, caravan, boat, garage or shed with ease. Also perfect for keeping round the house for use during power outages, Halloween and night time events. 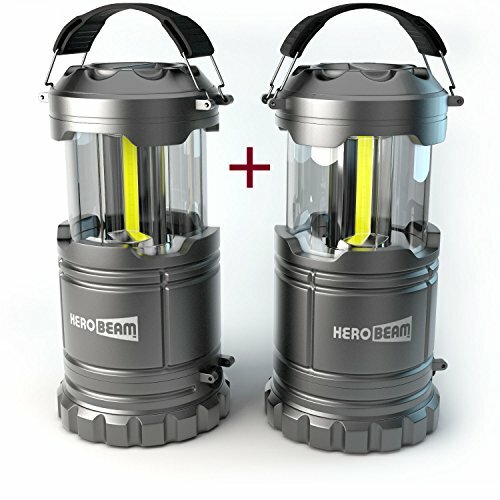 If you have any questions about this product by HeroBeam, contact us by completing and submitting the form below. If you are looking for a specif part number, please include it with your message.